Wellsville • Because Utah was not exactly a flashpoint of the Civil War, we have been insulated from the debate about whether to tear down the monuments to Confederate generals who fought to defend slavery. That doesn’t mean we don’t have our own relics of a racially troubling history that we try to gloss over out of a misguided reverence for a past that didn’t really exist. And our’s aren't cast in bronze. Case in point, the “Sham Battle” held as part of the Founders‘ Day festivities in the town of Wellsville. As they have since 1916, more than a century ago, a handful of folks from the idyllic Cache County town paint their bodies crimson red, put on head dresses and something approaching native outfits, and slather on war paint to re-enact an apocryphal clash between the Indians and the hard-working Mormon settlers. This, apparently, is something people still actually do in Utah in 2017. “We don’t do blackface but we’re still doing these kinds of things throughout the United States,” said James Singer, the co-founder of the Utah League of Native American Voters who teaches sociology at Westminster College and Salt Lake Community College. 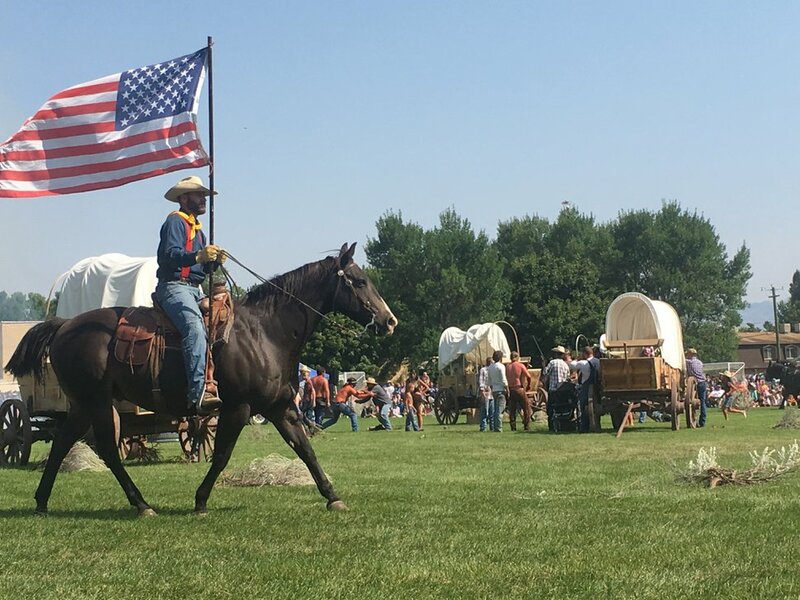 Thousands turned out Monday on the baseball field behind Wellsville’s old elementary school for the culturally tone-deaf cowboys and Indians spectacle that all hinges on a brazen rewriting of history. A teepee was erected behind home plate, a cabin sat in center field and covered wagons circled the area when the makeshift natives arrived on horseback, whooping and firing guns, just as years of spaghetti Westerns taught us they behave. A husky-voiced narrator lays the scene: The Shoshone hunting and gathering in the fertile area, when the hard-working white settlers rolled into the Cache Valley in 1856. The suspicious natives watching “from bush and hill, behind mountain foliage and trees” as the settlers with their “firesticks” hunted animals and sang songs around the campfire. Tensions grew. A small replica of a cabin is set ablaze and the narrator tells how the Indians stole horses and cattle and kidnapped young white children. The reality, as is always the case, is not as tidy. The Mormon settlers in the Cache Valley had forced the Shoshone off of their traditional lands and the natives, facing starvation, conducted raids and skirmishes on the settlements and wagon trains, which were followed by retaliatory raids, skirmishes and executions. In 1863, about 250 soldiers from Fort Douglas attacked a Northwest Shoshone winter camp at Bia Ogoi, near what today is Preston, Idaho. The Indians fought back, but after two hours ran out of ammunition. (Robert Gehrke | The Salt Lake Tribune) Participants in the annual Sham Battle that is part of the Wellsville Founders' Day celebration dress up as Shoshone Indians, settlers and members of the U.S. Army to re-enact the type of skirmishes that took place during the settling of the town by Mormon pioneers. The troops raped the women and bashed in the heads of others with axes. Young children were held by their ankles and their heads smashed open. One infant was thrown into the freezing river and drowned. Chief Bear Hunter, a leader of the band, had a hot bayonet rammed through his ear. The winter grain was stolen and 75 lodges were burned. All told, as many as 500 Shoshone were wiped out, and historians now consider the Bear River Massacre the bloodiest Indian slaughter in American history. That alone should tell us something: If the people of Wellsville can't tell the full story, it’s time to end its sanitized dress-up cowboy and Indian play. We have to be able to commemorate our heritage and celebrate the pioneers’ perseverance while acknowledging that our history is messy and complex and we shouldn’t keep hiding the truth under layers of red body paint.